Our hike starts from Mrayjat going down to the valley then along the river till we reach the ruins of Qab Elias Fortress in Beqaa, The trail is spectacular & unique with its views, cliffs, water falls, caves & clear fresh water river, its mostly downhill to plain a with some uphills, rocky paths, (hiking shoes or back country boots recommended). shepherd paths, river crossing & challenging uphill (about 100M) then a downhill & plain agricultural road till the end of trail. 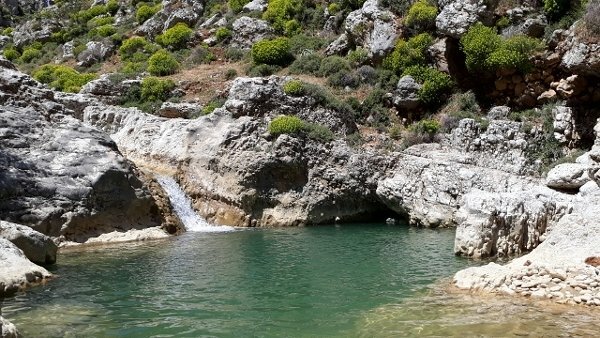 On our trail we will Pass by: Small cave, water falls, cliffs, small church (lady of Wedy El Deloum) located on the top of a cliff with fascinating panoramic veiw, vineyards & ruins of Qab Elias Fortress. We will stop on our way for breakfast (30 min). We will stop on our way back at a local dairy products shop in Mrayjat (15 min). We can pick up hikers on our way. (Whatsapp / SMS / Phone call) or Messenger. Kindly make sure you reserve before Friday April 26, 2019. -Cancellation is not accepted after Friday April 26, 2019. -Slight modifications to the event may occur, due to reasons beyond our control. -Bring your own lunch with you. -This event may be rescheduled according to weather forecast updates.